With all the focus on "usable security" lately I've been going insane trying to figure out how to get products to actually be useful for the common user. I was relatively sure that Kaspersky had things figured out, at least reasonably well, until this happened today. I can't explain it - I don't know what this "unknown application" is (my guess is that installing VMWare 6.5 somehow triggered this) but I do know I really wish there was a terminate process (or at least a DENY button). What am I supposed to click? 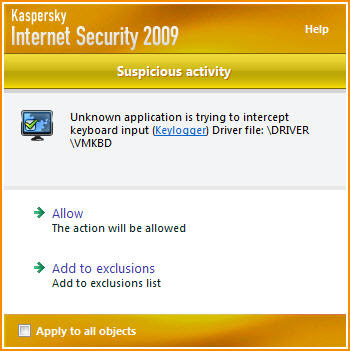 Is anyone from Kaspersky reading this? Can you tell me what the hell this is and what I should be doing about it? How do I investigate the root-cause? What if this really IS a keylogger?! I'd love some suggestions, ideas, or maybe just a clue. Wow? It just tells you that it's suspicious and doesn't block it at all? That's stupid! Are You an Incompetent Programmer? Google Chrome: Platform or Browser? Slides from CSI/SX 2009 Posted! My Talks Are on SlideShare!